Price incl. 5% discount when paying in advance by bank transfer. The reduced price will be shown in your shopping cart. Good news for our U.S. customers as of March 2016: Parcels valued under $800 can be simply imported duty free without duty & taxes now. 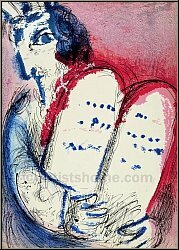 Original color lithograph by Marc Chagall for his renowned book "The Bible". This is N O T a mass-produced reprint (offset or grano lithograph from a so-called "Limited edition") but the original lithograph from Chagalls "Bible I", exactly as referenced in Mourlots catalogue raisonné. 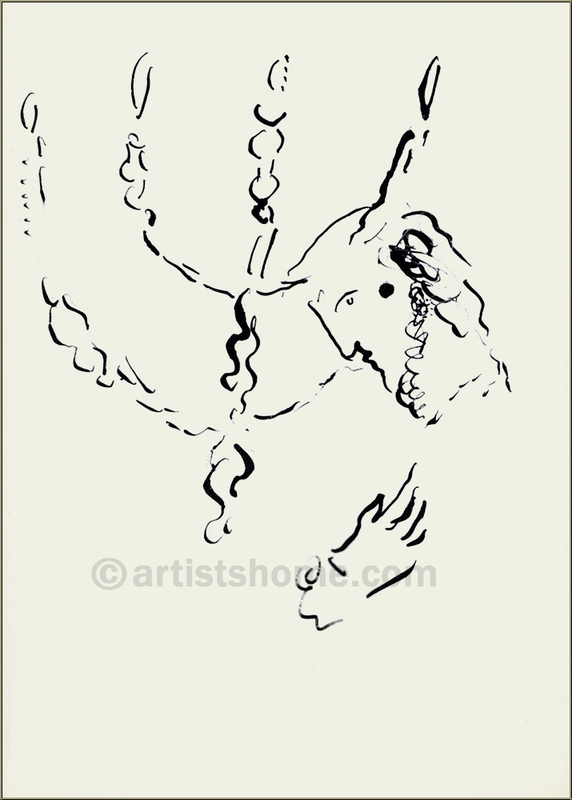 One of 6500 unsigned impressions for the book edition on strong velin paper. In addition, 75 pencil-signed and numbered impressions on Arches wove paper were published. In 1956, the French art critic and publisher Tériade brought out a special issue of the legendary art magazine Verve, which was exclusively devoted to one of Marc Chagalls major themes: The Bible. For this outstanding issue, Chagall composed 18 full-page colour lithographs and 12 in black and white. 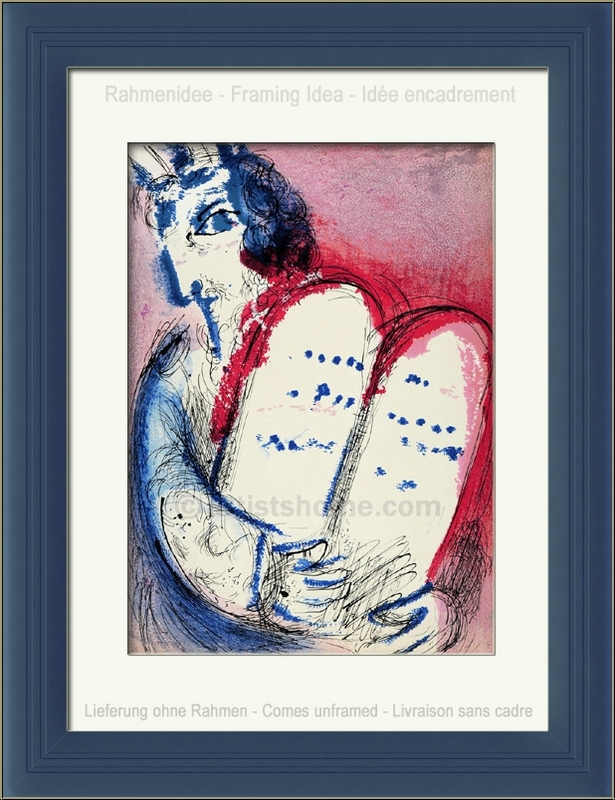 For his "Bible I" Marc Chagall focused on characters from the Old Testament such as the Founding Fathers, the Kings, the Prophets and Angels. Four years later, in 1960, the follow-up issue "Illustrations for The Bible" was published, with another 24 gorgeous color lithographs. Since then, vast numbers of reproductions were put in circulation which are anything but original(!) lithographs. Your print is being delivered with an abstract from the a.m. catalogue raisonné. In addition, you'll receive a proof of identity (without selling price) in case this print is intended as a present. In very good condition, a well-preserved impression from the archives. Frame not included in delivery. Perfect service : the package was delivered in perfect conditions, very quick and with very useful information concerning the litho. This nice piece of art will receive an appropriate place in our house. Thanks again ! Customer ratings may only be submitted by customers who have bought this item and are logged in. Your name will, of course, be displayed anonymized (e.g., "Tom H., United Kingdom"). All items offered here are in stock and ready for immediate dispatch. They are sent out within 24 hours of payment.